Jake Libby's career looked like it might be over before it began as he was unable to even get into the Cardiff MCCU team. 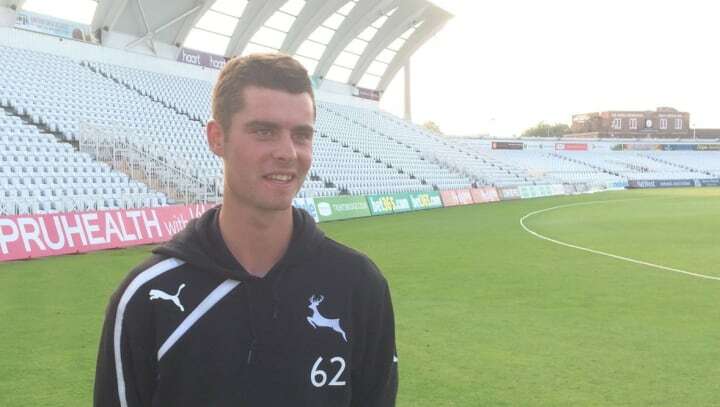 Only three months ago he was playing club cricket in Cornwall, but now he is aiming to become a fixture in the Nottinghamshire side after his brilliant century on debut. The 21-year-old's 108 against Sussex in the final game of the season made him the first batsman to score a maiden First Class century in their County Championship debut for Notts since 1946. Libby is determined for his moment in the spotlight not to be the high point of his promising career. He said: "It's strange. I didn't get into the Cardiff MCCU scheme in my first year at university. "I didn't get in the side in my second year and I had to work hard to get into the team in the third year. "I think I've progressed my game a hell of a lot and I've matured as a cricketer. I know my game a lot better. "It's really happened this year for me." Notts Academy manager Chris Tolley recruited Libby this summer after leaving Cardiff Metropolitan University. He scored 225 not out in his first appearance for the seconds against Warwickshire at Edgbaston in July and during the game found out he had got a 2:1 in sports and exercise science. A month earlier he was playing for Callington in the Cornwall Premier League, but last week he was opening the batting alongside Alex Hales and making hundred with James Taylor at the opposite end. With so much coming so fast, Libby admits the last few months have been a lot to take in. "It was very strange (batting with Hales and Taylor). You watch these guys on TV so to walk to the middle with Alex was very strange," he said. "It's amazing to play with these guys. It's been a massive transition in my life coming here, but something I've always wanted and dreamed of. It's amazing. "Obviously this my dream to play on stages like this in the future. "It's a great start but that is what it is, a start. I'll work hard this winter. "There are things to work on. Hopefully I come back next year and try to nail a spot at the top of the order. "It's a lot tougher than cricket I've played before. I had to really graft and mentally that took a lot out of me. "I've got to thank the people who got me up here like Chris Tolley. (Coaches) Mark O'Leary at Cardiff MCC and Sean Hooper at Cornwall have been massive getting me up here. "Once here I've tried to take my chance with the twos and the academy. It's been a high pressure summer but I'm glad I'm coming to the end of it with some success." Libby is set to continue his transition away from his Cornish roots by travelling to Australia this winter to play club cricket in Tasmania. He was born in Devon but emphasises his Cornish heritage, taking pride in his transition to the First Class game. He follows in the footsteps of current team-mate Ben Kitt and former Notts man Charlie Shreck, but he has a long way to go to match the most successful import to the county. Mike 'Pasty' Harris spent 13 years at Trent Bridge and scored 19,196 career First Class runs with 41 centuries. "I'm Cornish. I'm really proud to be. I've had a lot of messages since my hundred," Libby said. "It means a lot. There haven't been many people from Cornwall to play First Class cricket."